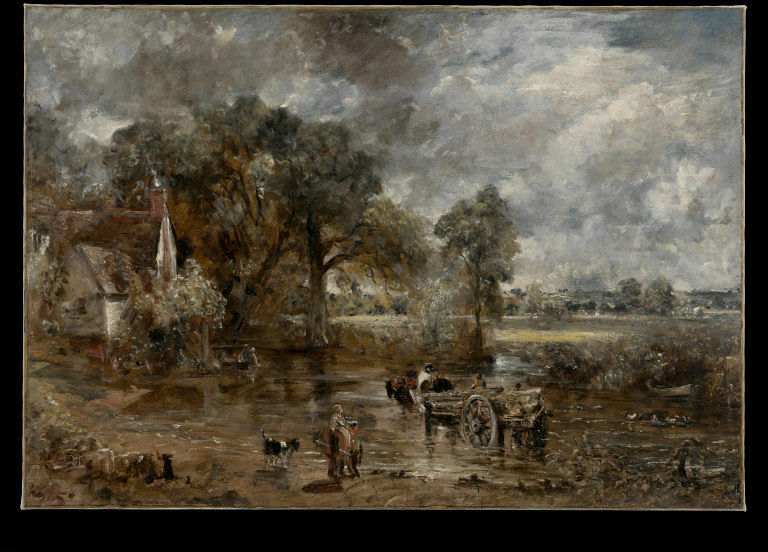 Constable often made full-scale studies for large exhibition paintings. He used a broad painting style to establish the general balance of the composition and its colours. This study is for his most famous work, The Hay Wain, exhibited at the Royal Academy in 1821. The painting is now in the National Gallery. The scene is near Flatford Mill. This is catalogue no.209 in Reynolds "Catalogue of the Constable Collection" (1960), plate 159. This is the full-scale study for the painting exhibited by Constable at the Royal Academy in 1821 as "Landscape : Noon" (no.339). 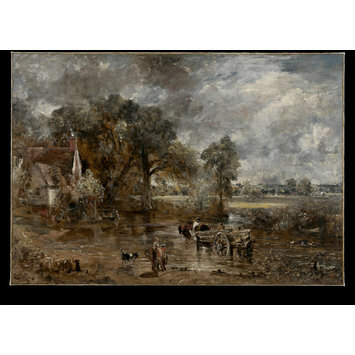 This is now in the National Gallery, London, and is popularly known as "The Hay Wain". The early history of this full-scale study, and also of the full-scale study for "the Leaping Horse (also in the V&A, museum number 986-1900, Reynolds cat. no. 286) is unclear. Constable was very keen on keeping his studies; "He used to say...that he had no objection to part with the corn, but not with the field that grew it" (quoted in R and S. Redgrave "A Century of Painters, Vol.II, 1866, p.396). So it is likely that constable would have kept both until his death. At the Executors' sale on 16th May 1838 there is a listing for "Two - Sketches of Landscapes..." which are believed to have been these two large studies. This lot was boght apparently on behalf of Constable's family, and in that event it seems that both these sketches may have remained for a while as the property of the artist's family. The next information about the two works comes from some notes on "The Hay Wain" by Mr. Henry Vaughan, who owned the final version of "The Hay Wain" and gave it to the National Gallery in 1886 - his notes were also bequeathed to the National Gallery. In these he wrote "The two studies... have now  been exhibited at the kensington Museum [V&A] for many years... They were first seen by me at the house of Mr. C. R. Leslie, RA. [Constable's friend and biographer] who admired them greatly. Eventually they came into my possession, by purchase of Mr D. G. White...". Leslie was storing the paintings "for want of room elsewhere". He cleaned the surfaces with the help of his son R.C. Leslie, who also made small copies of each. Mr D.T.White was a dealer who was active in the 1850s. Mr Vaughan lent the sketches to the Kensington Museum [V&A] in or before 1862. The earliest reference to them in the Museum's records is contained in a list of pictures on loan on 24th October 1862. Interestingly it is noted that at the time of the International Exhibition in London in 1862, it was possible to compare the sketch of "The Hay Wain", hung in the Sheepshanks Galleries, with the completed work which was then hanging in the next door gallery. The sketches seem to have remained permanently on loan in the Museum except when the were lent to the International Exhibition in London in 1874, and to the Edinburgh International Exhibition in 1886. Mr Vaughan died in 1900 whereupon his bequest of the two works to the Museum came into effect. The early history of this full-scale study, and also of the full-scale study for "the Leaping Horse (also in the V&A, museum number 986-1900) is unclear. Constable was very keen on keeping his studies; "He used to say...that he had no objection to part with the corn, but not with the field that grew it" (quoted in R and S. Redgrave "A Century of Painters, Vol.II, 1866, p.396). So it is likely that constable would have kept both until his death. At the Executors' sale on 16th May 1838 there is a listing for "Two - Sketches of Landscapes..." which are believed to have been these two large studies. This lot was boght apparently on behalf of Constable's family, and in that event it seems that both these sketches may have remained for a while as the property of the artist's family. 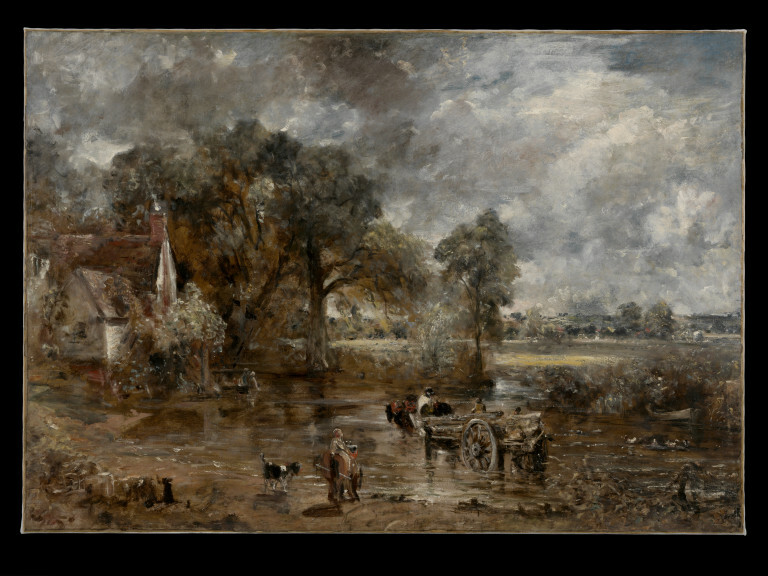 The chief of Constable's four exhibits in 1821 was 'Landscape: Noon' ('The Hay Wain') (National Gallery No. 1207; for the full-scale sketch see No. 209 [987-1900] in this Catalogue). His third child, Charles Golding Constable, was born on 29 March. He accompanied Archdeacon John Fisher on his visitation of Berkshire in June, took No. 2 Lower Terrace, Hampstead, for his family during the summer and autumn and paid a visit to Fisher at Salisbury in November. Lyles, Anne, ed. Constable : The Great Landscapes London: Tate Publishing, 2006. ISBN: 1854375830.